Smell and taste these hops! Tanks bought in Germany and then trucked up I-5. Bottling one six pack every second. Tom Bunger: Do you want this for your house? Emil and I took a tour of Deschutes Brewery today. Amazing! They are the #1 brewer in Oregon, #6 Craft Brewer in America, and the #13 Brewer in the United States. Yes, I was listening to the tour and thinking how much Tom Bunger needs to visit, so we can go here. We tasted several good beers, including the Black Butte XXII. Much tastier once it warms up. I made homemade oregano and parmesan focaccia bread yesterday. Whipped up some turkey meatballs tonight. They are super easy to make. Ground turkey, one egg, a couple of handfuls of seasoned breadcrumbs, couple of tablespoons of pesto. I brown them in a little olive oil, then dump in some Classico Cabernet Marinara Spaghetti Sauce. Perfect to go with the focaccia. I also mowed the lawn today, so extra activity points from Weight Watchers. Hand over another breadstick, please. We fished last night at dusk near Steelhead Falls, and Emil caught a fish. It was a beautiful hot night, and it gave me a chance to use my new headlamp (thanks to United Way generous staff and REI). This morning, we went back to fish again a little downstream. Two brief hook ups for me, sunburnt and three hours later, we headed back home for some shade and cooler temps. My first attempt at bread is pictured above. I am reading a delightful book called "Ratio: The Simple Codes Behind the Craft of Everyday Cooking" by Michael Ruhlman, from my good friend, Mary Ann Bush. The first chapter was the ratio to making bread, so I gave it a try today. It did seem a little time consuming to whip up the bread, let it rise, shape it, and proof it, but it was definitely worth it. I will make bread again and throw in some roasted garlic next time. Speaking of peeling grapes, we have a lovely grapevine on the corner of our deck. One of the homeowners' children said her Mom makes grape pie. Well, I had to give that a try! I found a grape pie recipe, courtesy of an annual grape festival. My first surprise was purple grapes have light green guts. For some reason, I assumed they would be purple. Interesting. Peeling the grapes was easy! Just pinch the opposite side of the grape where it's attached to the stem. Four cups didn't take long. You may gasp when you read this next sentence, so there's your warning. I have only used a lawnmower once in my life. Probably because my Dad always mowed the lawn, and my job was to crawl around with the hand trimmer, while listening to my walkman player. Cool. Cook orzo in salted boiling water according to directions. Drain and set aside. While pasta is cooking, saute onion, green pepper and garlic in olive oil in a large frying pan. Cook until soft, about 3 minutes. Add tomatoes and oregano; bring to a simmer. Add shrimp. Cook about 5 minutes until they turn pink. Spoon cooked orzo in pan and combine. Remove from heat, add basil. To serve, spoon serving of pasta and shrimp mixture into a bowl and top with feta cheese. I borrowed this recipe from Weight Watchers, and it's 7 points. Delish! I served it with garlic bread and salad. Today was a good day on the farm. Little Red, one of the chickens, laid an egg, so that's two in a row for her. Emil worked on the lawnmower and diagnosed a carburetor problem. I started a fire and burned our paper/cardboard and pulled weeds. BIG NEWS: My Uncle Ron and Grandma are coming to visit! We are looking forward to exploring Redmond and Bend with them. Today, we relaxed and took a day off from housework and chores. After picking up The Source Weekly Entertainment paper for Bend, we saw several festivals scheduled for this weekend. First stop: Bend Fall Festival. Food booths galore, live music, arts and crafts. We picked up a plate of yakisoba noodles with teriyaki chicken from the vendor below. The thigh pieces were served on a kabob stick and were tender and very flavorful. The noodles were mounded on the plate and perfectly seasoned. One vendor in particular stood out. Guten Tag Bags. Handmade here in Oregon, and they are SO CUTE. I already googled them, and she sells them on http://www.etsy.com/. I'll have to pick up a bag from her. Second stop: Farmers Market over at Northwest Crossing. It was small and catered to an upscale crowd. Many of the vendors sold organic beef and goat. Two bakery vendors, veggie vendor and a fruit vendor. We picked up two peaches grown in Tacoma (shout out to Tom Bunger). It was a fun day, despite a little rain. Back at the farm, we collected two beautiful brown eggs. Just in time for a little Sunday baking if the rain continues tomorrow. Next items on my checklist: either join the gym or pick up a step and exercise DVDs (thanks to Lori Moore for the great idea), make a wish list of places to eat in Bend and Redmond (I have a list for Portland, thank you Spencer! ), and work on my book. I also still need to try and relax a little instead of running around every minute of the day cleaning, cooking, worrying and more. Any tips on how to relax? Great for breakfast (coffee cake texture) or topped with ice cream for dessert. This recipe comes from Gourmet magazine. I made it last night with frozen blueberries from Costco, and it was great! Lots of liquid, but don't worry! It will bake in. I made my favorite turkey meatloaf tonight. It tastes great, and your hands don't get dirty mixing it. The recipe is from Epicurious, but I've made some modifications (I know, big surprise). Preheat oven to 400 degrees. Grease a glass or aluminum pan (rectangular 11 x 7 or so). Cook onion and garlic in olive oil in a skillet over medium heat for 2-3 minutes. Add carrot and cook about 3 minutes. Add mushrooms, salt and pepper and cook, stirring occasionally, until liquid mushrooms give off is evaporated and all veggies are tender, about 10-15 minutes. Stir in Worcestershire sauce, coarse dijon mustard and 3 good squeezes of ketchup. Transfer veggies to a big bowl and let cool 10 minutes. This round does not have mushrooms, as the store was out of crimini! Stir together panko and milk in a bowl and let sit for 5 minutes. Add this to vegetables. Then add eggs to vegetables. Finally, add turkey and another round of salt and pepper. Use wooden spoon to stir everything together, then dump into the pan and shape with the spoon , leaving 1-2 inches open on the sides. Cover the whole dang loaf with ketchup (including the sides), and bake for 50-55 minutes or until thermometer inserted reached 170 degrees. Let meatloaf stand for 5 minutes. Then, you all can fight for the end pieces. I serve this with cheesy polenta and a green salad. Enjoy! It was a busy day today on the farm. I collected one egg from the chicken coop, cleaned up the coop and surrounding areas, swept off the wrap-around porch, watered plants and more. Much different type of work than several weeks ago when I was gearing up for the United Way Campaign. I miss everyone there so much! Plus, those daily runs to Kaladi in the mornings.... hello Kaladi Latte. We visited True Value Hardware and Fin and Fire flyfishing shop in Redmond. 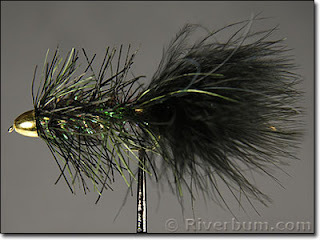 Secured non-resident fishing licenses, picked up some streamers, nymphs and a guide to fishing Central Oregon. Also chatted with some avid fisherman who gladly pointed out where to fish. They all said that we could fish a different spot each day of the year close by, and it would never be the same spot twice. Very cool, indeed. I've never lived in a state with a bottle deposit, so we investigated one center today at Fred Meyer. The machine jammed a lot, and there were several people in line. We will venture back in the early morning to test it out. I saw several Moms with kids push a cart up full of coke cans or beer bottles. Our first fishing trip was to Steelhead Falls near Crooked Creek Ranch. 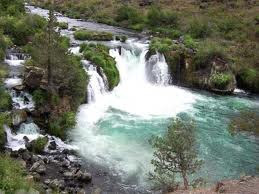 It's part of the Deschutes River, and we were told to fish at dusk and bring headlamps. Okay.... Emil caught an 11 inch rainbow using a Conehead Flashabu leech.